When you think Egg Moi Moi, think Nigerian Moi Moi prepared with eggs as the base instead of beans. Egg Moi Moi is very easy to prepare. Feel free to use other ingredients you use to prepare omelette such as tomatoes. You can use ugu instead of spinach. You can use tatashe instead of sweet peppers but please note that tatashe is spicy while sweet peppers are not. Divide the ingredients into the number of bowls you have. Break and beat the eggs. Add salt and mix well. Slice the onions and distribute into the bowls. Distribute the beaten egg, spinach leaves, diced sweet peppers and sardines. Pour some water in a pot, place a base in the pot to form a steam set up. Set on the stove to boil. 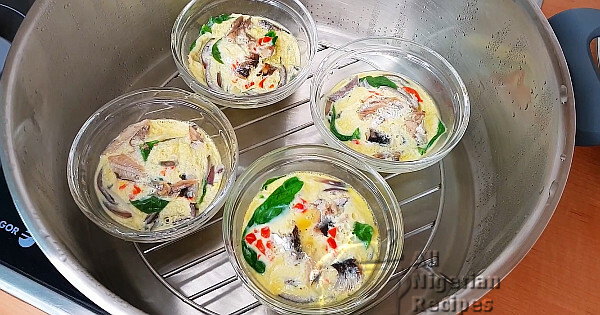 When the water boils, place the bowls of egg moi moi in the pot, cover with aluminium foil, cover the pot and steam for 10 minutes maximum or till the Egg Moi Moi cakes. Serve quickly before it deflates. I prepare Egg Moi Moi in two ways, watch the video below for another method where I use different ingredients. 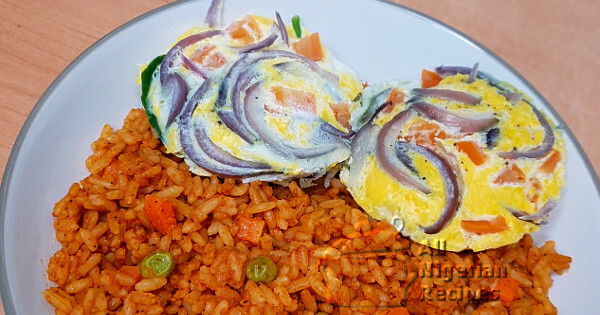 Serve immediately with bread toast, Jollof Rice, Fried Plantains etc.